Visiting Norfolk, VA - Things to do, entertainment, events, places to stay. 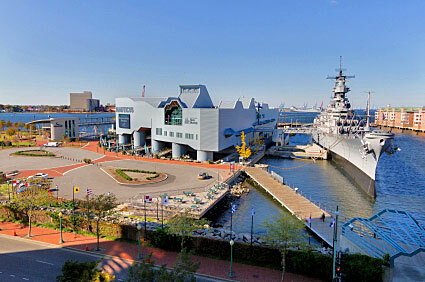 The City of Norfolk, Virginia is the home of the world’s largest Naval base, has miles of sandy Chesapeake Bay beaches, a historic downtown district, a complex of waterfront shops and restaurants, a collection of cruise boats and ferries, and an excellent selection of museums. Norfolk Hotels: See special offers. Many travelers come to the city to attend conventions and conferences or to board one of the cruise ship cruises that departs from the Half Moone Cruise Terminal, which is located right next to Nauticus. So much of what the city has to offer is concentrated around the Elizabeth River waterfront that it’s easy to fit in some sightseeing. Things to see and do include a visit to Nauticus and the Battleship Wisconsin, viewing world-class art at the Chrysler Museum, or maybe taking in a performance at one of the city’s many theaters and concert halls. During the summer, there’s AAA league baseball at the waterfront Harbor Park. The Norfolk Waterside Marriott is located across the street from Waterside Markeplace, convenient to the city’s waterfront and downtown attractions. More about things to see and do while visiting Norfolk. There are often events and concerts scheduled for Town Point Park along the waterfront of the Elizabeth River Norfolk truly has something for everyone. Read more about Norfolk events. Norfolk Waterfront Marriott – Great location, right across from Town Point Park and the Elizabeth River. Courtyard by Marriott Norfolk Downtown – Central downtown location, near MacArthur Center Mall. Sheraton Norfolk Waterside – Located on the water, adjacent to Waterside and Town Point Park.